Download the album at http://mcsnacktime.com All My Demos are "Secret Demos" Track List: 01. 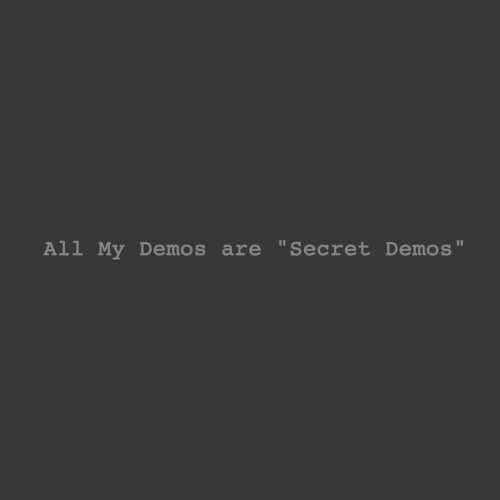 All My Demos are "Secret Demos" ft W.I.T.T 02. (This is My) 3rd Introduction 03. Coil Ft Lex Price 04. People Take Warning 05. Family Ft Lex Price & Melia Buccelli 06. So Long ft Spookyboy Album produced by W.I.T.T and MC Sn@ck T1me. All songs written by MC Sn@ck T1me except Track 1 written by W.I.T.T, and Track 6 written by MC Sn@ck T1me and Spookyboy. Tracks 1, 2 and 4 by mixed and mastered by W.I.T.T. All songs recorded in MC Sn@ck T1me's dinning room, except Track 1 which was recorded in W.I.T.T's backyard, and Track 6 recorded in MC Sn@ck T1me's dinning room and Spookyboy's bedroom. MC Sn@ck T1me: Vocals, samples, keyboard, guitar and bass Lex Price: Vocals on Tracks 3 and 5. W.I.T.T: Vocals on Track 1. Melia Buccelli: Vocals on Track 5. Spookyboy: Vocals on Track 6. Users who like All My Demos are "Secret Demos"
Users who reposted All My Demos are "Secret Demos"